Turner Clinic Executive Director Mindy Goldstein and Turner Clinic students Jolie Schamber 16L and Kari Reed 16L (pictured) are working with Georgia Organics and the Atlanta Local Food Initiative to amend Atlanta's zoning code to allow urban and market gardens. The Turner Environmental Law Clinic has provided pro bono legal representation since 1998 to individuals, community groups, and nonproﬁt organizations around the country that are ﬁghting to protect the environment. 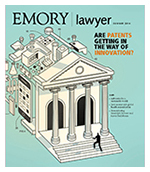 This unique clinic gives Emory Law students the chance to practice environmental law on real cases in real time. Successfully challenged decisions regarding the safety and environmental risks posed by nuclear power generation and the resultant nuclear waste. 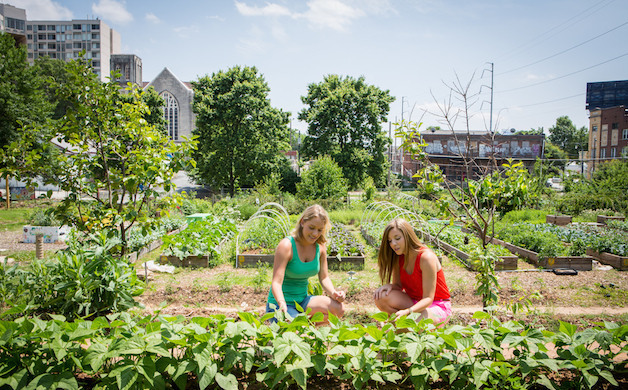 Helped promote sustainable agriculture by assisting the City of Atlanta in amending its zoning ordinances to permit farmers markets and urban agriculture. Prepared comments that convinced the Food and Drug Administration to withdraw and reissue its proposed regulations governing the growing and harvesting of produce. Encouraged transparency in government decision making by successfully challenging the Department of Energy’s decision to withhold information regarding its nuclear loan guarantee program. Helped protect water resources and encourage conservation by filing comments on a power plant’s draft permit to withdraw millions of gallons of water a day from the Savannah River. Partnered with local watershed protection organizations in monitoring new reservoir proposals in Georgia. Answered questions for environmental organizations regarding conservation easements. Partnered with the Natural Resources Defense Council to report to Congress the ways the National Environmental Policy Act has protected human health and the environment. Identified legal barriers to distributed solar generation in Georgia.